there are plenty of clips of trump during the campaign saying he will not cut Medicaid and or social security. and that is exactly what he is supporting now. He also said he will make your medical plan cheaper and better at the same time. Here is last weekend's link to the most compulsive serial liar in the history of the USA and possibly mankind. Again he had something like 3000 to 5000 lawsuits he was involved in,, and in one lawsuit alone they caught him in the deposition with 30 lies. That is just one lawsuit. It took a full page to list the ones since he was president. And these are the serious ones. well they came out and lied and called the media liars. what hypocrites from the biggest liars known to the USA. Ya we know if you watch Fox your IQ really does drop as you are dumber than a person who lives in a cave. Again Fox is the right wing hero when it's top brass and people are nothing but sexual molesters criminals rewarded and heros of the right. Gee trump is the same... goo figure for those right wing family values. this exchange was excellent by the reporter, absolutely no responsibility shown by the white house for their lies, who gets fired when they lie well no one. Were they elected to lie? Well in a right wingers mind ya... they love liars and the bigger and more the better, again shown by the support of the 35% including those idiots on this forum, the lemmings who follow with blinders on at all times. During today's briefing, White House Deputy Press Secretary Sarah Huckabee Sanders got into a heated exchange with Brian Karem, the Executive Editor for The Sentinel Newspapers. Sarah Huckabee Sanders sharply criticizes the TV network but refuses to take questions from the outlet. Despite cries of fake news by the Trump administration, the Russia investigation is not going away. Congressman Eric Swalwell of the House Intelligence Committee weighs in. liar liar pants on fire... making huge public threats against the former right wing head of the FBI. President Trump’s lawyers, after rethinking their legal strategy, have shelved plans for now to file complaints accusing former FBI director James Comey of leaking confidential information about his conversations with the president, according to two sources familiar with the lawyers’ plans. The decision to back away from repeated public threats to launch an all out legal assault on Comey reflects a significant tactical retreat for Trump’s legal team. It was prompted by concerns that such a move might antagonize special counsel Robert Mueller as he gears up for his investigation into Russian interference in the 2016 election and possible ties to Trump’s presidential campaign, the sources said. Because of trumps lies and rapes around the world he is a discrace and being laughed at all over except in Russia and Isreal. After speaking for double the allotted time at a German conference, Commerce Secretary Wilbur Ross got his mic cut, triggering laughter and applause from the audience. 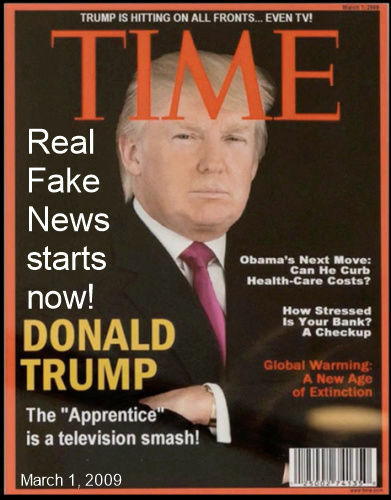 And he made a fake Time magaine cover with him on it--and hung it in his golf clubs! There is nothing that he hasn't lied about. had to make the changes... artistic fake liberty.